This is the G227E X-Y core driver board from the MM8-E 4kx12 core memory option. This board was used to decode the address from the omnibus and drive the correct X any Y lines in the core memory with a controlled current. The reading or writing of the core ( 58K) was done by the G104 sense inhibit board ( 80K) . 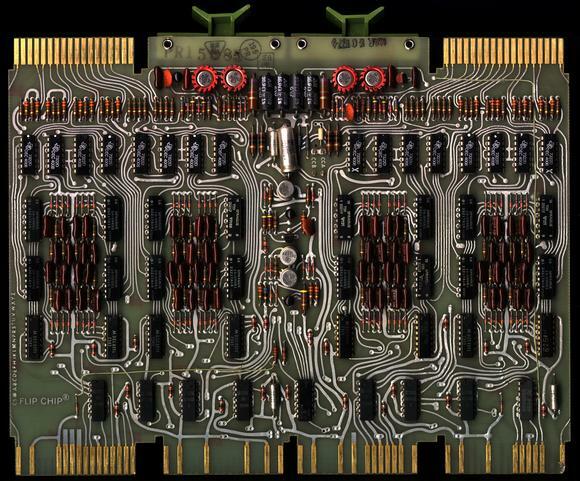 This board has several green wires from an ECO (engineering change order) to the board (fixes a design error). Back view of board.